lt;stronggt;RCPA152GRElt;/stronggt;lt;BR/gt;Rubbermaid Web Foot Wet Moplt;BR/gt;Antimicrobial protection on launderable wet mop inhibits the growth of bacteria that causes odors amp;amp; stains. Balanced blend of cotton and synthetic fibers delivers up to five times the absorbency of cotton mops, while looped-end, open-twist yarn reduces linting. Tailband allows the mop to cover more floor area per stroke, saving time and money. 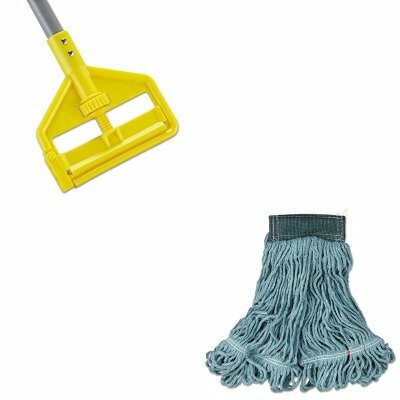 Head Type: Wet Mop Application: Floor Maintenance Mop Head Style: Looped End.lt;BR/gt;lt;BR/gt;lt;stronggt;RCPH146lt;/stronggt;lt;BR/gt;Rubbermaid Web Foot Wet Moplt;BR/gt;Easy-change, side-gate design allows you to quickly slide mop heads on or off. Adjustable thumb wheel enables stress-free, tight and secure clamp down. Solvent- and acid-resistant frame enables use with all commercial floor stripping agents. Handle Length: 60amp;quot; Handle Diameter: 1amp;quot; Handle Material: Fiberglass.